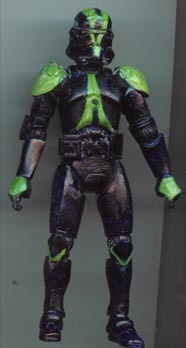 This figure got painted twice. When I first found the pic on Wookieepedia, I assumed that I should make the trooper the exact opposite of a 501st Clone - blue for white, white for blue. Because of the background, the picture looked like there was a yellow filter on it. I went back to the page after I made the figure, because I had no idea what to call it. Then I actually read the entry and it describedfound out that the armor is black with yellow/green markings - just like the ref pic!